Tonight, as was I was fumbling with my keys to get into my house, I was besieged by the frantic barking of the dogs in the apartment building next door. It’s not a new complaint. These dogs are only the latest in a series of frantic dogs who have lived in that particular apartment over the years, which got me musing about the occupancy criteria. Potential tenants (PT): We love it! We’ll take it. Landlord (LL): OK, great, but I need to ask you some questions first. Do you have a dog? PT: Um, we have two. The ad said dogs were allowed. LL: No, that’s great. How big are they? PT: Oh, they’re small. Chihuahuas. LL: Perfect. Do they bark a lot? PT: Well, they’re protective. Yes, I guess they can be a bit vocal at times. LL: But could you characterize them as “yappy”? PT: Some might call them that. But, they’re only like that when they get bored or lonely. LL: How often are they left alone? PT: We both work, so they’re alone pretty much all day, and well, frankly most of the evenings too. PT: Like we said, they’re protective. If anyone comes close to the house, they’ll probably bark. PT: I don’t know, 50 yards? Yeah about half a football field in any direction sounds right. LL: Perfect! Your dogs sound like they will continue the long distinguished history of bored-psycho-yappy dogs that have occupied this particular apartment. I’ll get you the paperwork and we’ll get you moved in ASAP. Welcome to the neighborhood. About a week ago, on a beautiful sunny winter’s day, I was rushing to leave the house to go meet a friend. Yogi, the little cat who I had taken in a month previous, was vacillating, as cats do, about whether or not she wanted to go outside. She parked herself, half in and half out, in the middle of the doorway. I didn’t have time for her nonsense, so I gently nudged with my foot to go outside. She was already down the walkway by the time I turned around from locking the door. And that was the last I saw of her. Yogi was to be my great experiment in having an indoor/outdoor cat. She had been outside for several weeks before she finally walked in to my house and made herself at home. She knew a good thing when she saw it. When I let her out on previous occasions, she would hang for a while outside, but was always eager to come back into the house. I never had to bribe her or even ask twice. She was an odd little cat. It was in November that she started making guest appearances at the spot where I feed Pretty, my longtime feral cat. This little black and white stranger was not at all skittish, and would immediately start purring and making air biscuits when you picked her up. I figured with a cat this tame, that she must belong to a neighbor and was just another annoying moocher who came around and ate Pretty’s food. I’m very protective of Pretty, and any creature who disturbs our routine is subject to my annoyance. One of my neighbors, Bonnie Jo, who feeds a feral colony at the end of my street, decided to take on Yogi (whom she called Pogo) as one of her clan, and started feeding her and set up a little cat house for her on my property, away from Pretty. I had no problem with that. With a regular feeding schedule (Bonnie Jo is like clockwork) and a warm place to sleep, Yogi became a regular. Even Pretty even learned to tolerate her. And giving Yogi a nice petting in the morning became part of my routine. One sunny day in January, it was so warm I had my front door open as I went about my household chores. Yogi parked herself outside the screen door in the morning and started looking inside longingly. “Oh don’t try to make me feel guilty, young lady”, I told her every time I caught her looking in. She just sat there. And sat there. And sat there some more. All day. Finally, around 4:30 pm I broke down and called her bluff. “Fine. You want in? I dare you to come in.” I opened the door and in she walked. 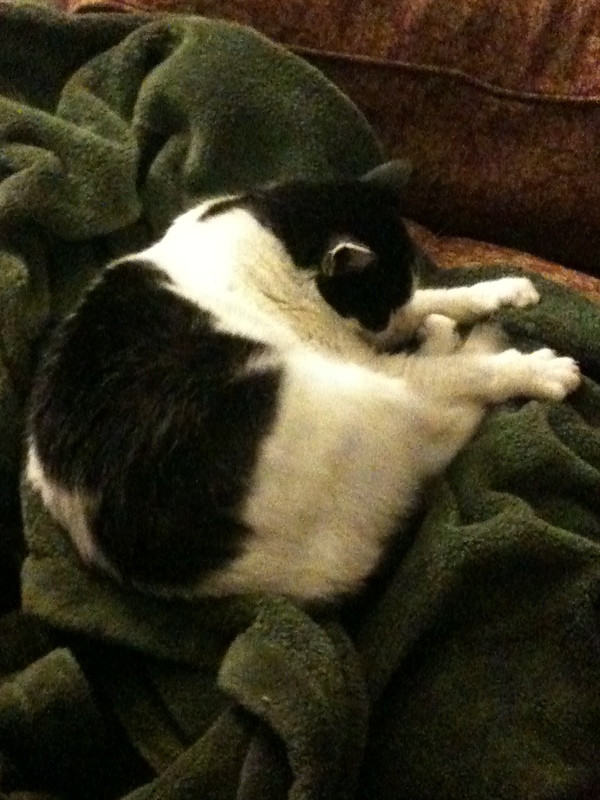 And after some initial inspection of the premises, she curled up on my favorite blankie and went to sleep. For the first couple of days, I would put her back outside when I wasn’t home. She needed to get checked out by a vet before it was safe to to have her interact with my other cats, Sasquatch and Tangerine. One morning, however, she decided that this arrangement was not suitable and wanted to be in the house NOW. As I was getting ready for work, that damn cat started leaping up on my window sills and climbing my screen doors. She would not take no for an answer. After I made some minor configurations of the house in order to keep the newcomer away from the old timers, Yogi moved in. Yogi and I had a strange relationship. Maybe it was the bold way she foisted herself on me, or maybe it was learning within a week after she joined the household that she was soon going to cost me $600 to get a possibly cancerous lump on her side biopsied (plus the promise of further medical costs and/or the pain and sadness of watching her decline). She had her moments of being very affectionate and sweet, but most of the time she was indifferent to to everyone in the household. She was an odd little presence, but I accepted her and was willing to take care of her, though she wasn’t necessarily in my heart. But, I certainly didn’t want her to leave. There are, of course, theories as to where Yogi has gone. I try not to dwell on the bad scenarios. I’m hoping maybe her previous people found her and there was a joyous reunion. Or perhaps she just walked into someone else’s house to try them on for a while. Or maybe she was merely an emanation who came into my life as to test how open my heart was. If that was the test, I fear I failed it. Today is the day I’m finally going to bring Pretty, the feral cat that I’ve been taking care of for the last five years, into the house and try to tame her down. I’ve prepared my home office with a litter box, a safe hidey-hole and have spritzed the entire room with At Ease, a pheromone-based herbal calming spray. I have no illusions that this will be particularly easy, but I’m going to give it a go. It has taken a long time for this little cat to trust me enough to let me pet her, to be able to pick her up. I hope I don’t blow all that collateral in this attempt to bring her in so she is safe and warm. Pretty was no where to be found when I went downstairs to feed her this morning. I am not entirely surprised as this has been happening more and more. Other cats in the neighborhood have apparently caught wind to the fact that there is food and a shy cat who refuses to fight for her territory over here. Pretty isn’t dead. When I head out to my car to go to the grocery story, she comes dashing up the stairs in search of food. I’m ecstatic to see her, but the nerves kick in as I know this is my big chance. My landlord left me a voice mail on Monday evening. “Hey, LB, listen a termite inspector is coming on Wednesday and he needs to come into the house and have a look around. I can let him in and show him around, but I need to know what the protocol is with the rabbits.” my landlord said rather gently. My second reaction was my usual one whenever someone, besides the boyfriend and a couple of close friends, is going to be coming into my house: panic. Neurotic old tapes start blasting in my head. I’m going to be judged. People are going to know what a dirty, bad person I am. I am not good enough. I must hide the evidence of my slothful ways. Shame. And no, my house is not that bad (though, admittedly, with the advent of shows like Hoarders, the bar is now set pretty high). I’m not going to win any awards for my housekeeping skills. And I am certainly not one of those people who think cleaning is stress relieving, or even fun. But, I don’t need my house to be immaculate in order to feel comfortable. So, Tuesday night and Wednesday morning I throw myself into a cleaning frenzy in anticipation of the termite inspector and my landlord coming into the house. The termite guy is scheduled to be here at 11:30, so at 11:00 I finish up and mop myself into a corner where I can finally collapse into my comfy chair. With the floors clean there is nothing else to do but wait. On the side table next to my chair is a nice collection of reading materials, plus my iPhone. Plenty of things to do to bide my time and take my mind off the impending disaster I’ve created in my head. But instead, I opt to just sit with it. Look at it. Sense it. My body is vibrating. The anxiety feels like an electric charge running throughout my veins. I stop to sense my heart beat. A bit fast and irregular. In fact the more I focus on it, the more irregular it seems. I stop focusing on my heart beat. I notice the urge to pick up my iPhone and distract myself with one of my favorite games, Bejeweled. But no, just sit with it. What is this story I am telling myself? Mostly it is a fear of being judged. Normally, not a huge fear of mine, yet when it comes to my living quarters, it’s huge. It’s like when I open up my home, I am opening up me. Come inside. Look around. Here is my private self. Judge me judge me judge me. Going deeper. Where the hell does this come from? Am I really that insecure? I don’t think so. Memories of growing up ashamed of where I lived. Wrong side of the tracks. And all of my friends came from the right side of the tracks. Hiding. Lying. And my mother’s shame. She grew up with more. She never wanted that house. Her depression deepened when we moved to the little shack next to the freeway. Don’t invite your friends over. She just gave up. So, this is the story that is running through my head. And it’s not even my story. It’s my mother’s. And every pore in my body was in it at that moment. Damn. The termite guy finally shows up at noon. Lovely man. My landlord doesn’t join him on the inspection. It took all of five minutes. We probably spent more time talking about Mr. Binkles who ran over to check out this stranger in the paper booties. He doesn’t see any sign of termites. Have a good day, ma’am. I change the channel in my head from the History Channel to more reality based programming. It’s all just one story or another. Some pleasant, some unpleasant and some neutral. Some are mine and some I’ve inherited. Just another day.